Parking Lot to Elfin Lakes - Length, 11 km; suggested time, 3 to 5 hours one way; elevation change, 600 metres. The trail follows Paul Ridge and provides beautiful vistas. At Elfin Lakes, Columnar Peak, the Gargoyles, Opal Cone and Mamquam Icefield come into view. 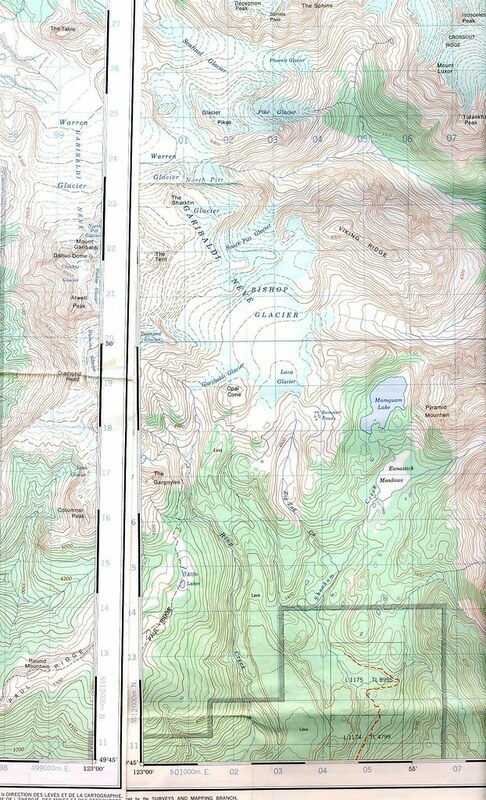 Elfin Lakes to the Opal Cone - Length, 6.5 km; suggested time, 2 to 3 hours one way; elevation change, 250 metres. Trail leads down to Ring Creek then climbs the Opal Cone, an extinct volcano with a crater. Garibaldi Neve and Mamquam Lake can be seen from the top. Elfin Lakes to Little Diamond Head - Length, 7 km; suggested time, 2 to 3 hours one way; elevation change, 625 metres. This is a fairly arduous hike past the Gargoyles (strange visages sculptured by nature in lava) to 2,100 metre Little Diamond Head.